There are three chickens in the garden. The boys have named them Black Foot, Hobbes and Caramel and tiptoe out in their pyjama pants to check for eggs. Oh don’t start. Children are pragmatists. Just last week Medium grabbed a shovel and removed a dead pigeon from the water feature, tipped it over the bank then dug a small grave, covered the bird in a bit of gravel and came in for lunch. “Were you sad about the pigeon?” I asked later. Sabbatical Man is dangerously devoted. 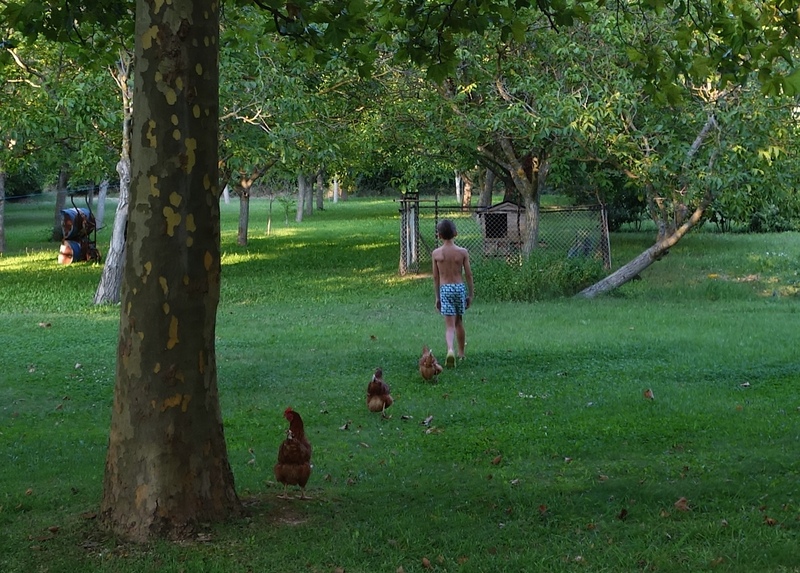 He keeps standing out there looking at them saying: “chook, chook, chook”. There is no indication that they return the affection. How could they? Brains the size of M&Ms. Monsieur Y, the “gardener” who cuts the lawns and sprays only sideways glances at weeds and thistles, gives the chickens a week. Has he seen Sabbatical Man’s chicken enclosure? It is constructed to standards of engineering hitherto unknown in the French chicken coop design world – though perhaps not obvious to the layperson. Monsieur Y tips back his head and hurls a ferocious guffaw in the general direction of the chicken house. 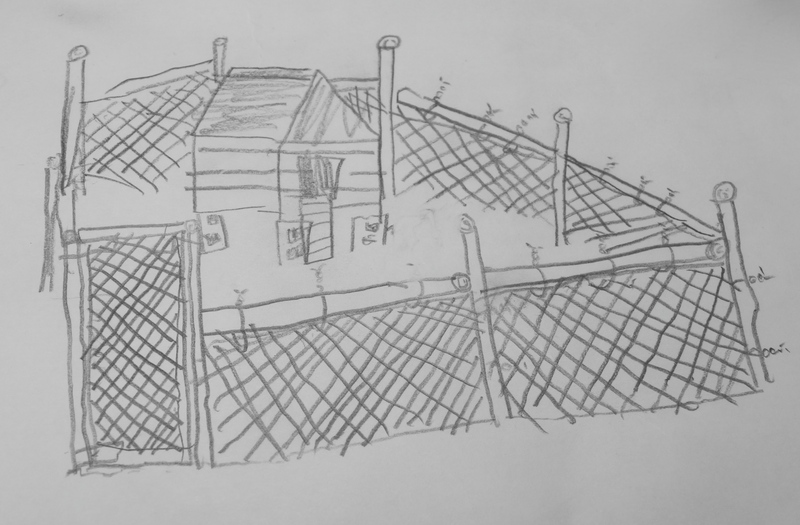 The coop is made up of what was once a dog kennel, placed high on concrete blocks, surrounded by a yard encircled with chicken wire and topped with rails. It even has a gate. The entire thing was made with materials scavenged from around the farmlet on which we live. It stands in a field of nut trees next to two other monuments to my husband’s noisily idling work ethic: a mountain of neatly chopped and stacked firewood and a huge and lush potager sprouting all manner of vegetables. Monsieur Y blows air out his lips and looks out to the perimeter of our little pocket of Provence. “There are foxes out there – but you’ll never see them. If you hear your chickens brrrrrAAAARRRK brrrrrrAAAARRK in the middle of the night, that’s a fox,” he says. But surely the fence is high enough, strong enough? Of course! I’d forgotten everything I had learned from Fantastic Mr Fox. Foxes can climb, dig, balance, make plans, wear pants, have complex relationships with their children and sound a lot like Meryl Streep and George Clooney. I should have reminded Sabbatical Man. Mind you, that would have been awkward given that I was pretending not to notice that there was a construction project underway in the nut orchard (did I mention I was against having chickens?). Also, I’m kind of leaning toward Team Fox. Come on, if you saw both a chicken and a fox strapped to a railway track in the path of a fast-approaching train, who would you save? I couldn’t look past the smart, foxy one. Life is hard for foxes. They need all the chickens they can get. Anyway, I’m too scared to even look at Sabbatical Man. Regardless of what you think of foxes, Monsieur Y’s casual dismissal of his latest design-build project is, well, it’s unprecedented. Sabbatical Man is a quiet man, a humble man, but if pressed, he will admit to knowing something about construction. In fact, he knows everything about construction and his abilities in this field are the reason we are in France right now. Yet this isn’t the first time Monsieur Y has found fault with Sabbatical Man’s work. A couple of months ago he failed the potager – blowing an imaginary whistle and holding an invisible yellow card high in the air, bellowing triumphantly: “Carte Jaune! Carte Jaune!”. My how Sabbatical Man laughed. The potager infringements were relatively minor and easily fixed – a hump where there should be a trough, a trough where there should be a hump, a little problem with spacing. However, I sensed a frisson of tension between these two men of similar age who both like to work outside with their shirts off looking both manly and fetching at the same time. So, the enclosure, Monsieur Y insists, must be entirely covered with chicken wire and the fence must be dug deep into the ground or, failing that, a wide, tough matting must surround the coop so the fox will get tired of digging and go play Monopoly with her kids. Sabbatical Man nods gravely and puts his hands on his hips. The man I used to know, before we came here, would have had that coop redesigned and rebuilt by midnight or maybe two if that’s what it took. Instead, his work ethic coughs, chokes and stalls quite unexpectedly and Sabbatical Man does absolutely nothing. That night, he locks the chickens in the dog house. Then, the man who assured me that chickens were easy, that chickens look after themselves, that chickens will impose no extra responsibilities on my carefree year in France, disappears to London for five days. Rise no later than 8 am to let the chickens out. Place eggs in containers provided. If chickens have shat in their own nest, remove it. Fluff up hay with two bamboo poles. If weather hot, leave gaps around floor uncovered to provide air conditioning. If weather cool or wet, cover gaps with hay. Wash water bowl, add water, give to chickens. Wash food bowl, add food, add water, mix to precise consistency and give to chickens. 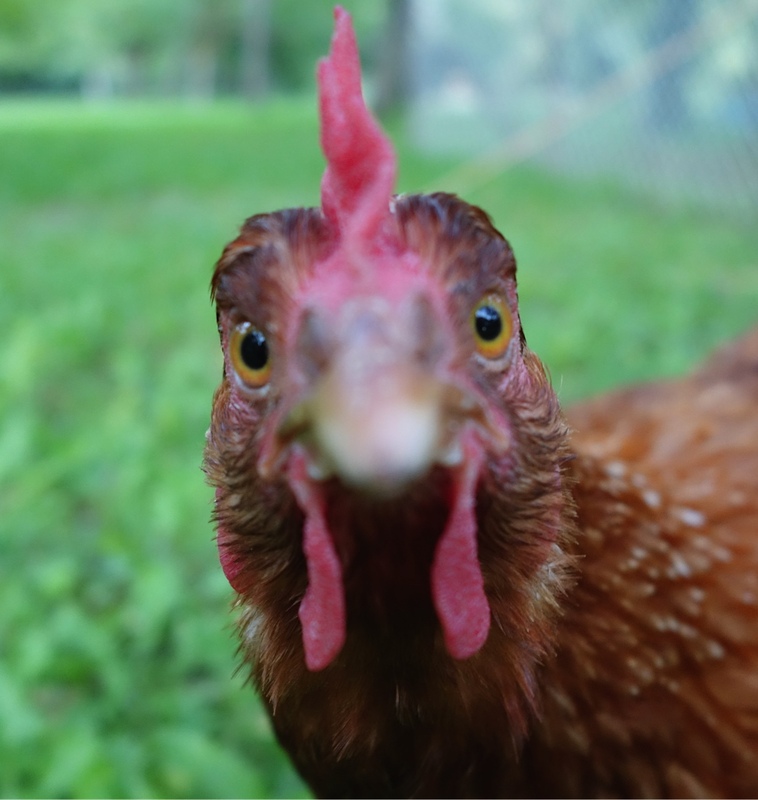 Let chickens roam free out of the enclosure all day but don’t let them be killed by predators. Offer fresh scraps and top up if necessary with chicken porridge. Repeat nest instructions if necessary. Trap chickens and herd them up the ramp into the house. Return to house and set alarm for morning. Keep an ear out for foxes. “That it?” I say, laser-beaming Sabbatical Man with my eyes. “That’s it,” he laser-beams back. “You get all that?” I say to Medium without breaking laser contact. Sabbatical Man turns to go and pack his bag. I turn to go and find my book and feel something squelch under my jandal. Some of the best conversations I’ve ever had. Great pics btw. Love your work. Excellent!! We aim to please. Kids have taken to eating omelettes for breakfast so none to spare:( The butcher told me yesterday that the chickens are supposed to lay at least two a day and every woman in the butchery nodded in agreement.Obviously they’re not feeling the love enough. Look forward to meeting chickens??? Maybe? Where is Steve? C u Tuesday. Medium has always been an animal lover, love the photo of him with the chickens. Had me laughing out loud! When’s the next instalment? Excellent 🙂 Next week I imagine, Fox be willing.